The internet is bursting with one-bowl healthy pumpkin brownies that involve throwing a box mix and some canned pumpkin puree into a bowl. While those healthy pumpkin brownie recipes are really easy, the result is more meh than marvellous. I think you deserve oh so much better. Don’t you? But never fear! The alternative isn’t spending hours slaving away in your kitchen for bakery-worthy brownies. The solution is to grab 1 bowl (yes, just 1) and make these healthy pumpkin brownies in 30 minutes. Throw in the dry ingredients. Mix in the wet ingredients. Bake the batter in the oven. And you’re all set. Easy peasy. The result is a low FODMAP dessert that’s entirely gluten-free, dairy-free and just 85 calories per great big brownie. Plus, you’ll know exactly what went into each and every mouthful you shovel in. 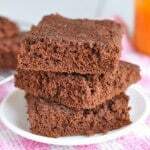 As well as being gluten-free and dairy-free, I also say these healthy brownies are entirely fat-free because there’s no added oil or butter. All the yummy fudge-like bit comes from super-healthy pumpkin puree. A few disagree and say these brownies do contain fat because the batter calls for 2 eggs. If you want a healthy pumpkin brownie recipe without any oil, butter or eggs, check out my recipe for the fudgiest fat-free healthy pumpkin brownies in the world. They’re not low FODMAP or gluten-free, but they are dairy-free and even lower in calories than these healthy brownies. They’re just 80 calories each. If you’re not following a restricted diet and are happy to eat all the gluten and dairy you can get your hands on, you can totally adapt this recipe to the stuff you have in your cupboards. The gluten-free flour blend can easily be replaced with ordinary all-purpose flour. And if you’re not avoiding dairy, feel free to throw a handful of chocolate chips in. If you are following a non-dairy diet, you can still sprinkle some chocolate chips into the batter! These non-dairy chocolate chips are 100% vegan and paleo friendly and add a yummy chocolate hit to these brownies. Just keep in mind that the calorie count will rise a little. But when these healthy brownies are only 85 calories each, I think we can push the boat out a little, right? One serving of this healthy pumpkin brownies recipe is a 9th of the tin. Not a 16th. Don’t you just hate recipes where they cut an 8″x8″ dessert into 16 servings instead of 9 to get the calorie count low? 1/16th of a 8″x8″ dessert pan is never enough. It’s a much better idea to use healthy ingredients, like pumpkin puree, to reduce the calories. You could cut the calorie count down even further by using a powdered sugar substitute, like Stevia or Xylitol. But I’ve got no experience doing this so I can’t really guide you. Leave me a comment and let me know how it turned out if you give it a shot! The low calorie count isn’t the only good thing about these healthy pumpkin brownies. Each serving contains 27% of your recommended daily dose of vitamin A! Definitely not something you’d expect from a dessert recipe, right? Vitamin A is super important for stuff like keeping your immune system healthy, maintaining proper eye function and supporting healthy bone growth. So just focus on that when you’re reaching for your second brownie. 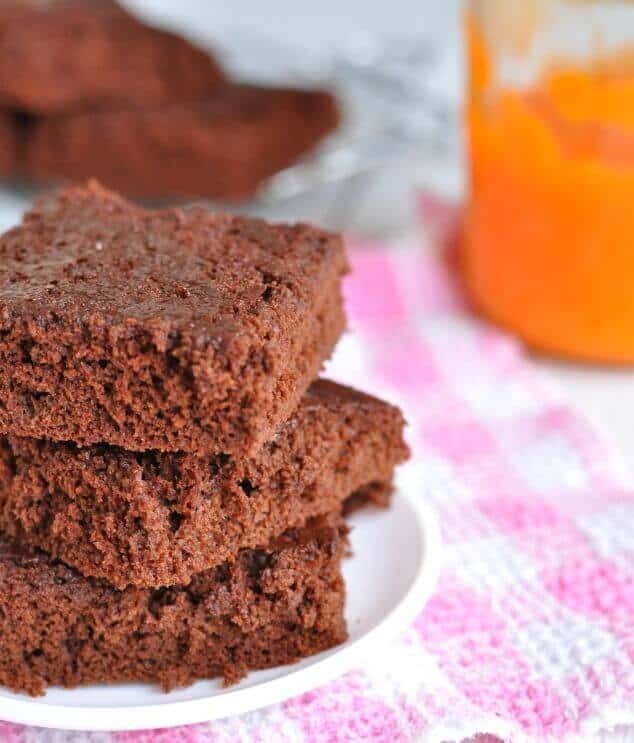 These healthy pumpkin brownies are amazing! They're low FODMAP, gluten-free and dairy-free and come in at just 85 calories each. Can you believe it?! Preheat the oven to 350F/175C and line an 8" square baking tray with parchment paper. Grab a medium bowl and stir together the sugar, flour, cocoa powder and baking powder. Make a well in the centre of the dry ingredients and crack in the eggs. Scoop in the pumpkin puree and beat with a hand whisk for 1 minute, until the ingredients form a thin batter. Pour the batter into the lined baking tray and bake in the preheated oven for 12-15 minutes, until the edges and the tops of the brownie are just set. Pull the brownies out of the tray using the parchment paper and leave to cool on a wire rack for at least 30 minutes. 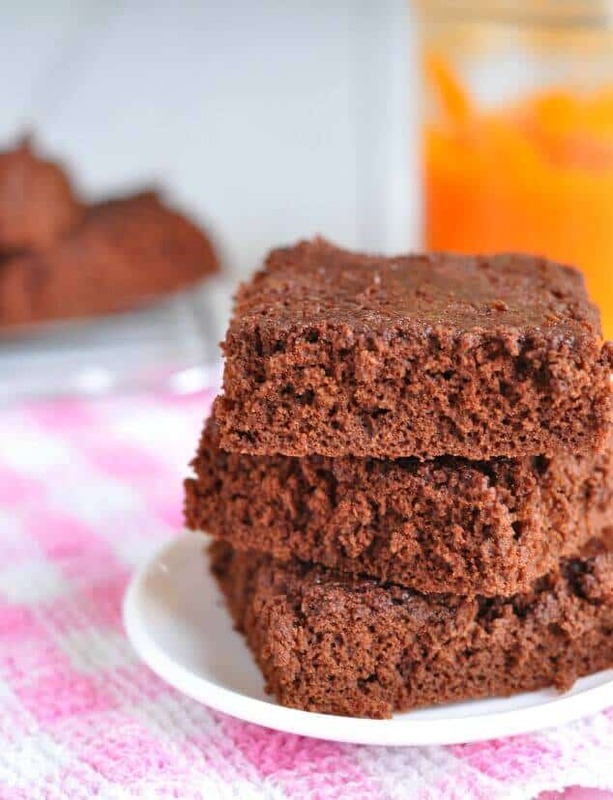 When cool, slice the brownies into 9 squares and enjoy! Or wrap with plastic wrap and store in the fridge for up to 5 days or in the freezer for up to 6 months. Thanks so much for the pin, Nan! Desert does not get better than this for me! Fat free, gluten free and sugar free. Made these with the new Swerve ( 0 calorie sweetener made only from fruits and vegetables). So good and moist…. this is my new chocolate chow down recipe. Thank you for such a charmer! Thank you so much for your lovely comment, Kristen! I’m so happy you love these brownies as much as I do and you’ve inspired me to give Swerve a try, too! These look delicious! I can’t say I have made many brownies, but I love the idea of adding pumpkin puree. 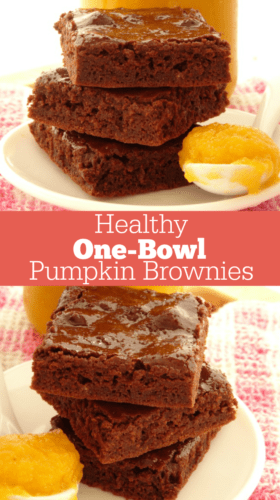 Ooh, I love the idea of switching pumpkin puree in place of the oils for brownies! Those look awesome!!! Thank you! Thank you so much, Cecilia! It’s always fun to play with seasonal ingredients, don’t you think? Your Pumpkin Brownies look amazing! Hope you are having a great weekend and thanks so much for sharing with Full Plate Thursday. Mmmm, what a wonderful flavor combination! Featured at Be Inspired this morning. I love all your recipes! They look yummy! I just made them. Do you know how many Weight Watcher Smart Points one would be?? Thanks! I’d love to help you out, but I’ve never done anything to do with Weight Watchers before, so I wouldn’t have a clue about Smart Points. So sorry! There are 171.2g of carbs in the whole recipe and 19g per brownie when you divide the batch into 9. I had to add about a quarter cup+ of water to my recipe…I think it was because I substituted flax eggs for real eggs. Trying to cut down on calories. I also used half the sugar and they were still yummy. I’m always trying healthier options in my baking- can’t let my sweet tooth cancel out my vigorous workout routine! Great recipe! I used some already cooked sweet potato that I had on hand from making baby food, instead of pumpkin and it worked well. I think maybe it made the batter a little thicker though so I also added half of a ripe banana to help smooth it out, although probably could have thrown in the whole thing. Also, cut the sugar to a 1/3 cup since my 4 year old insisted on adding about 1/3 cup of chocolate chips as well! It was all very yummy and not too sugary in the end. Good recipe. However, they aren’t FAT FREE, there are 2 eggs in them. Right?! It drives me crazy when a recipe says it makes a million brownies and it turns out each brownie is teeny tiny! What a great recipe! Do you think I could use butternut squash for the puree instead of the pumpkin? Thanks Jagruti! It’s a great way to get some extra veggies into your diet while still treating yourself! I love brownies, and I love that these are on the healthier side. They look delicious. Thanks so much, Michelle. I always love desserts that are a little healthier than others. I’m all about skipping the box mix and making home made baked goods from scratch so am totally behind these healthy pumpkin brownies! Much healthier and more rewarding when made from scratch! Thanks so much! I swear, take just one bite and you’ll never, ever guess they’re just 85 calories! You’re a woman after my own heart ~ pumpkin AND chocolate in one delicious treat, I can’t resist! I’m really not a big fan of pumpkin, but mix it with chocolate and I’ll gobble down the whole batch! These brownies look fun and delicious! I love pumpkin and chocolate and together they make a delicious dessert. I can’t wait to try your recipe! 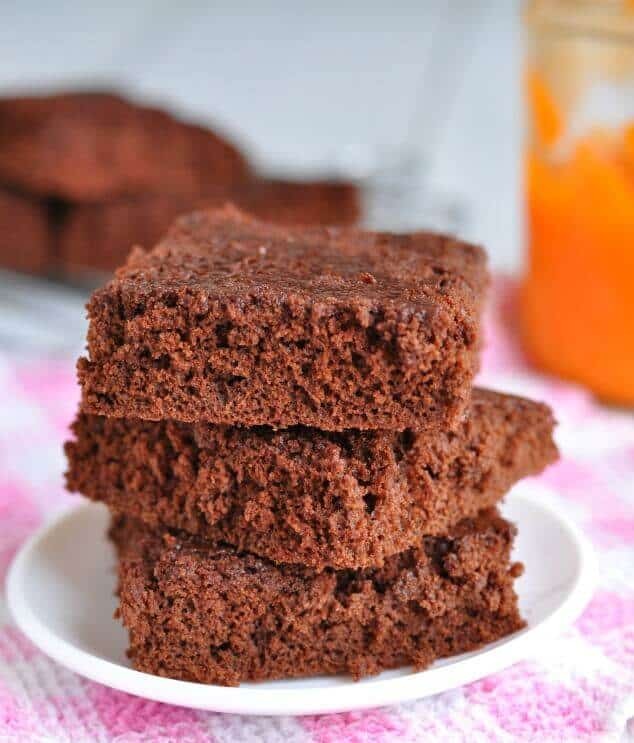 Love the idea of pumpkin brownies! Even better that they’re healthier! Thanks so much, Suzy. I can never say no to a healthy treat! They look really tasty, fab bright and light pictures too! 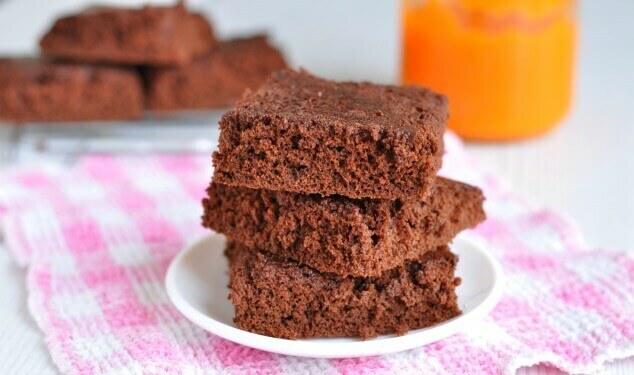 These brownies look amazing and so healthy! Can’t wait to try it! Thanks so much, Natalie. Hope you like them! Can’t believe these are so low calorie! Yep – only 85 calories each! Saving this!!! I think if I can manage to substitute with flax ‘eggs’ I might be able to make these vegan too! Yaay! I think this would definitely work with a flax egg substitute. Go for it, Tina! Love the low FODMAP recipe for those with dietary restrictions! These would be perfect to make for my sister since she doesn’t eat grains or dairy. Thanks for the recipe! !